Shappi, the acclaimed Iranian comedian, grabbed the comedy world's attention with her original sell-out Edinburgh show, Asylum Speaker. Both feisty and flirty, she softens a razor sharp wit with a deliciously dizzy delivery and endless charm. Comedian, best-selling author and Radio 4 regular Shappi Khorsandi is back this spring with her highly anticipated new show Shappi Khorsandi Live. Shappi is one of the hottest comedy prospects in the country. She’s feisty, flirty and effortlessly funny she handles every subject with a razor sharp wit, softened only by her deliciously dizzy delivery and endless charm. Shappi has notched up numerous high profile television appearances including; Masterchef 2013, Live At The Apollo, The Channel 4 Comedy Gala (2010, 2011 and 2012), Michael McIntyre’s Comedy Roadshow, The Graham Norton Show, Friday Night With Jonathan Ross, Have I Got News For You and her own Comedy Store Special for Comedy Central. She also had the honour of being nominated at the prestigious 2010 British Comedy Awards in the Best Female Comic category, up against fellow nominees Jo Brand and Sarah Millican. 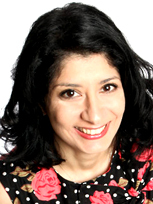 As a sought after cultural commentator, Iranian born Shappi has also appeared on Question Time and Woman’s Hour, as well as penning columns for several national newspapers and magazines including The Guardian, New Statesman and GQ. 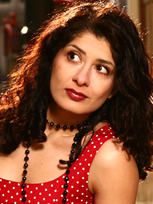 Shappi is also the bestselling author of A Beginners Guide to Acting English by Bloomsbury. In 2017 Shappi was a contestant on ITV's I'm A Celebrity...Get Me Out Of Here!